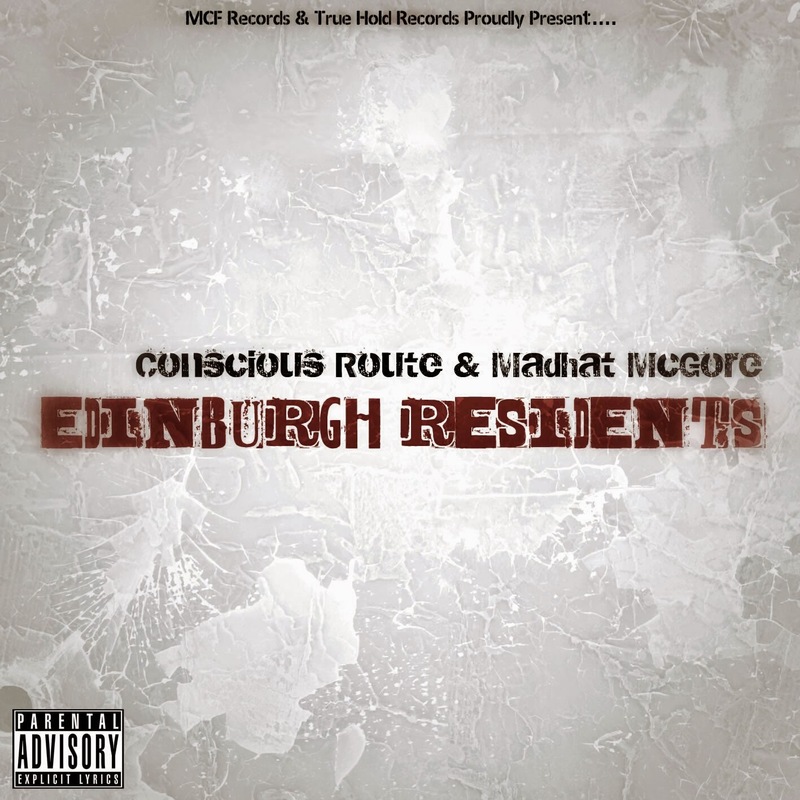 True Hold records in association with Music Comes First Records proudly present the Edinburgh Residents E.p by Conscious Route & Madhat Mcgore. Conscious Route & Madhat McGore met on the wrong side of the fence but overturned their differences to collaborate on this solid release. With two very different styles, the pair seem to bring a tangible mix of heavy Scottish and English flows. Show casing that the better together campaign may not have a been complete waist of time, at least in terms of music. A rapper, originally known as Mosman from England-based hip hop crew Fugazirum, Conscious Route has been working from his now-home city of Edinburgh, releasing solid music for the past three years. He has been building a strong reputation and gaining recognition from releases like the 'Sinking LP' with United Front artist Sean El, and the more recently released 'Labyrinth E.p' with the Monosapiens band, to name just two. Also networking hard and gaining features with French producer Marie Joly (Offering Recordings) on the track 'Just Be', and Mr Fox’s 'Quarantine' from Dubstep the label Simplify Recordings, plus many more, Conscious Route is fast becoming a well-known artist on the UK and International scene. The award winning recording artist from Edinburgh has been working hard behind the scene to work on possibly his greatest release to date with his Numbers mixtape. Featuring the likes of Mic Righteous, Lego & Squingy to name just a few, this release is expected to showcase that his lyrics, delivery and attitude have only sharpened since his last OMA nominated mixtape Wonderland was released. Hosted by London heavyweight DJ Livewire and production that keeps your head bobbing, you do not want to miss it. Set to be released early 2015 on digital distribution & free streaming sites Soundcloud & Bandcamp.